The Global Volcanism Program has no activity reports for Leonard Range. The Global Volcanism Program has no Weekly Reports available for Leonard Range. The Global Volcanism Program has no Bulletin Reports available for Leonard Range. An andesitic-to-dacitic stratovolcano complex in the Leonard Range is truncated by a 4 x 5 km caldera partially filled by Lake Leonard. The volcano (also known as Leonard Kniazeff) is located east of the head of Davao Gulf in SE Mindanao, east of the major N-S-trending Philippine Fault. Activity at the Leonard Range dates back to 1.1 million years. A dome building stage began about 290,000 years ago, producing a series of lava domes in the region surrounding Lake Leonard. A younger stage involved the eruption of the Paloc pyroclastic deposits from the late-Pleistocene to Holocene and the formation of the caldera. Holocene radiocarbon dates ranging from about 6000 to 1800 years ago were obtained from the Paloc pyroclastic deposits. The Leonard Range (or North Davao) area has been the object of a geothermal exploration program. The Manat thermal area is located north of Lake Leonard, solfataras occur its SW rim, and active solfataras, fumaroles, and hot springs are found in the Amacan-Gopod thermal area south of the lake. Del Mundo E T, Arpa M C, 2007. (pers. comm.). Ramos S, Zaide-Delfin M, Takashima I, Bayrante L, Panem C, Pioquinto W, 2000. Thermoluminescence dating in Mt. Labo and North Davao, Philippines: implications on geothermal wells. Proc World Geotherm Cong 2000, Kyushu-Tohoku Japan, May 28-June 10, 2000, p 1617-1622. Sajona F G, Bellon H, Maury R C, Pubellier M, Cotten J, Rangin C, 1994. Magmatic response to abrupt changes in geodynamic settings: Pliocene-Quaternary calc-alkaline and Nb-enriched lavas from Mindanao, Philippines. Tectonophysics, 237: 47-72. Sajona F G, Bellon H, Maury R C, Pubellier M, Querbral R D, Cotten J, Bayon F E, Pagado E, Pematian P, 1997. Tertiary and Quaternary magmatism in Mindanao and Leyte (Philippines): geochronology, geochemistry and tectonic setting. J Asian Earth Sci, 15: 121-153. Wolfe J A, 1982. (pers. comm.). There is no Deformation History data available for Leonard Range. There is no Emissions History data available for Leonard Range. The arcuate lake in the center of this NASA Landsat image (with north to the top) is Lake Leonard. 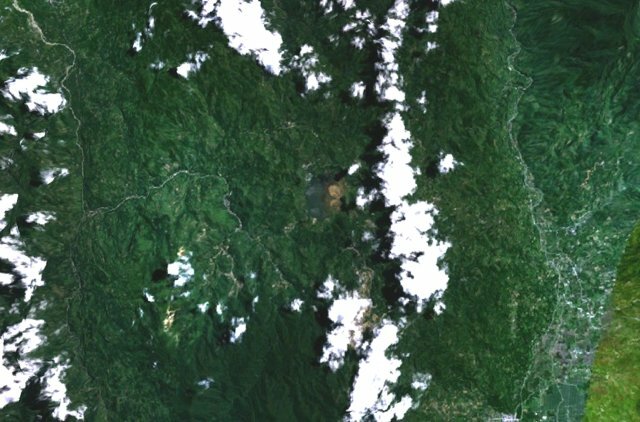 The lake partially fills a 4 x 5 km caldera cutting this andesitic-to-dacitic stratovolcano complex in the Leonard Range in SE Mindanao Island. Activity at the Leonard Range dates back to the Pleistocene, but explosive eruptions continued well into the Holocene, with the latest dated eruption taking place about 1800 years ago. Active geothermal areas are found both north and south of the volcano. There are no samples for Leonard Range in the Smithsonian's NMNH Department of Mineral Sciences Rock and Ore collection. Large Eruptions of Leonard Range Information about large Quaternary eruptions (VEI >= 4) is cataloged in the Large Magnitude Explosive Volcanic Eruptions (LaMEVE) database of the Volcano Global Risk Identification and Analysis Project (VOGRIPA).